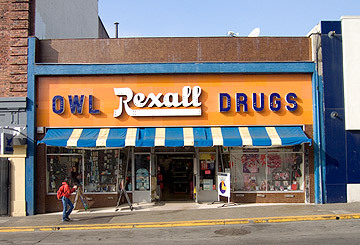 Owl Drugs. An anachronistically folksy small-town pharmacy and drug store (whatever that means nowadays) right on Telegraph. really fantastic font and design, especially for what is a generic style storefront. Funny. I just took a picture of their facade today in case anything happens to it. Like your pic better, though. They are selling out of all their inventory. They're not even going to try to make a go of it.